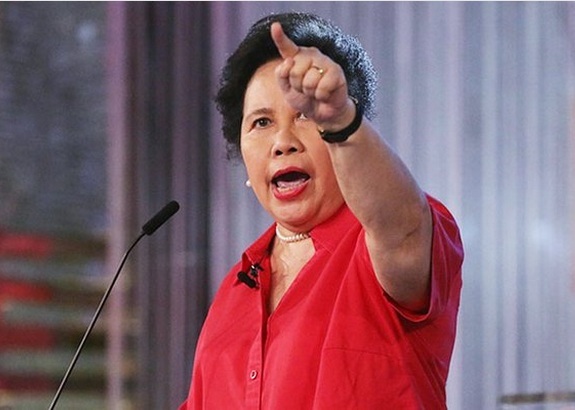 Senator Miriam Defensor-Santiago said she was back to normal and attended the final presidential debate held at PHINMA-University of the Philippines in Dagupan City on April 24. While she looked weak, paused a lot in-between statements, and seemed to lose her train of thought sometimes, she nevertheless fired her usual quotables which only a Miriam Defensor Santiago can really deliver. "Come hold my hand and I shall fly you to the future... where there will be rule of law, not merely rule of men or of people who bribe judges, and other arbitrators in litigation." "I have always loved the young people of this country, and I will never fail them in the next six years." "Kung nandyan sila sa ating katubigan at kinukuha pa ang isda natin, kamukha ng sinabi ko nung Immigration Commissioner ako, tatawagan mo ko, agad bombahin ko yang mga yan." "Napakadaling sabihn na igyera natin ang Tsina. E kung matalo ang Tsina, at nag surrender silang lahat, ano'ng ipapakain natin sa kanila?" "The President must appeal very strongly for discipline among drivers, both public and private." "I am vehemently against contractualization, not only is it illegal, but possibly unconstitutional. It violates the security of tenure of an employee and places him under the power of an employer who needs only to threaten to replace with a union member." "The best way we can help OFWs is not to make it a necessity for them to leave. It could be an option, but it should not be a necessity." "I have been the subject of much black propaganda concerning my health. I have never been false to the Filipino people." "In all these years, you have been shaped by the elitist background from which you come. Do you not think that the path has been too narrow to be able to be President of the Philippines?" "Kung tama ang gamot, mahihinto yun sila at mamatay. Namatay na sila." What is the role of your husband in your administration? "Dapat nandiyan siya sa bahay pag -uwi ko." "To stop the intermittent conflict in Mindanao, we have to adopt their customary and traditional law into our western style model of the justice system." "I have already shown you that I am what I am now. I am what I was today, and what I will be tomorrow." "We are not looking for an ordinary leader or an ordinary manager, or administrator. We are looking for the President of the Philippines." "There are three qualifications to become president: academic excellence...di naman pwede na yung naupo sa likod, yun ang magiging presidente ng Pilipinas." "Binigyan ako ng prestigious Magsaysay award for Government Service, quote, 'for bold and moral leadership in cleaning up a corrupt government agency', meron ba silang ganon?" "Unfortunately, there is no machine that you can attach to a human being so that you can tell whether that person is honest or not." "Di tayo pwedeng mamili base lang sa kursunada. O dahil uso din sa mga gang ninyo o tribes ninyo sa eskwela." "We are all united in this endeavour to improve and reform the Philippines." "Lalabanan natin itong corruption na naging bunga at sanhi ng ating kahirapan. We can fight corruption. I have shown it in Immigration Commission.I have not allowed my words to overcome my deeds." " For those who think that I should withdraw, because i have once been a cancer patient, this is what I say: I am now normal, I can think and I can act and I can pray." "I will never quit. I will never stop. I will never withdraw." "We all want to change the world for the better. But, the person who prayed should be emulated. He said, God, preserve this country and begin with me." 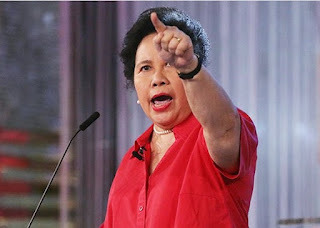 Miriam faltered many times during the debate, but her closing statement was full of fighting words. Take it from a woman, who "eats death threats for breakfast.